These two were selling lemonade and brownies on Ninth Avenue Friday. 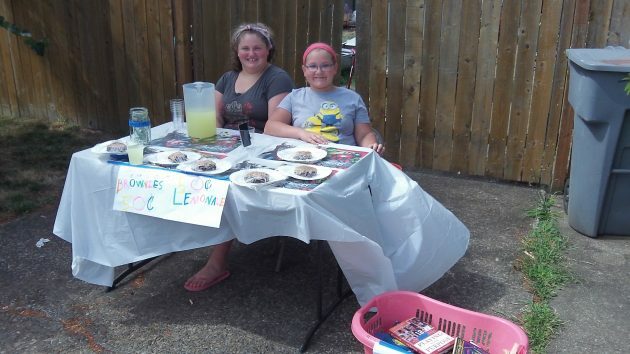 Here’s my annual pitch to nourish the roots of free enterprise: If you see some kids with a lemonade stand by the side of the road, make sure you stop and buy something, whether you like lemonade or not. Think of what it takes to start a sidewalk venture like that. You have to think of it first. Then you have to get your mom to OK the idea. Then you have to round up the ingredients and actually make what you’re going to offer for sale. Then the setup: Table, maybe a table cloth, and of course the all-important signage. You have to consider what price you’ll put on the sign. Too much and no one will stop. Too little and it won’t be worth the effort. And when all that is done, you have to sit out there and hope somebody comes by, stops and pulls out his wallet. That’s a lot to expect of someone who’s 11 or 12. Absolutely agree. Pre-teens learning about work, and selling, providing a product to customers is a life long lesson. When I was in junior hIgh school (way back in the 70’s) many of the under-16 crowd, and their moms, spent the day in the fields in June picking strawberries out in Jefferson. The school bus would pick up families at the grade school, then drive them to various strawberry farms in the morning. The bus would make a run around noon for folks who only worked 1/2 day, and another run in the evening for all day workers. After the strawberries were done, I set up business selling night-crawlers for the rest of the summer. What this meant was going out with a tin with twine that I wore around my neck, and a flash light, after dark over at the same Jefferson grade school. At that time, they watered the grass to keep it green in the summer (and there was no fence around the property as there is now). The watered, large expanse of grassy lawn, was prime night crawler hunting grounds. I’d usually sell out before noon, and have the rest of the day to do other summer things. Lastly, I would walk the town with my lawn mower, a five gallon bucket, water, and rags. I’d knock on doors offering to either wash a car or mow a lawn. This also worked just fine and allowed the 13 year old me to make pocket money. I have taught my girls (we have raised 4 now), that they need to earn their own money for things they want (but do not need). It teaches them to value money, realize that working is how one gets the things one wants, and gives them something to do in the summer while building a work ethic. So they too set up stands. When they were 16 they started working at local restaurants or fast food. But they learned to work before that first paid job. This past spring, our cherry tree was overloaded, so my 10 year old setup a stand and sold cherries for three or four weekends. She still has much saved, but has spent some on a few items she wanted. There are lots of nice Albany citizens who more than kept her in business — many paying more than the 50 cents per solo-cup that she was asking. Many complimented her on her activity, and we sure appreciate those folks. one wrote a letter to the editor, stating that it is illegal, as the child does not have the proper food handling license and that she was on public property (ie grass between the sidewalk and street in front of our house), and therefore needed a license for that. However, I am glad that our city police have better things to do and did not do as I have read about in other cities, and shut down such activity. However, the overwhelming majority have been supportive. The days of mothers taking their pre-teen kids to the fields to pick fruit and learn how to work have dwindled, but the neighborhood lemonade, or tea, or cherry, or stand is still alive and teaching valuable lessons to the youth who want to give it a try. By the way, I just noticed that it looks like the girls also have a pink basket of old books they may have been selling as well, in addition to the brownies and lemonade. Very nice! The mayor/city council has missed this revenue source? Think how educational it could be for these girls to learn what it’s like to be an adult in Albany.